Check out these great photos from Wilson's Senior game, a 3-0 win over Millikan, taken by Stephen Dachman. For me, there’s long been something distinctly special about Summer and Music (SAM). I once said that Long Beach’s homegrown concert series was the moment when the local scene shifted out of the shadows of LA and away from the association with Orange County. In other words, it codified for others what locals have long known: that Long Beach is a distinct music city all its own. And surely, there are countless events associated with SAM that have made this happen. What immediately comes to mind are events like Nick Waterhouse magically getting everyone to dance or seeing De Lux, Fartbarf, and Free Moral Agents sharing a single stage in the middle of the Pike. But ultimately, when it comes down to it, it’s the magic of the series’ iconic, annual season-ender Buskerfest that acts as the frosting on the SAM cake. No doubt, you get to see wonderfully seasoned veterans perform in one of the most intimate, unique settings: on the back of a flatbed in the middle of a street in DTLB. I’m talkin’ everyone from Cold War Kids and Rival Sons to Avi Buffalo and Tijuana Panthers have performed at Buskerfest. These bigger names are paired with a plethora of local bands who compete for the audience’s favor via votes with wooden nickels—and should they win, they can score a big prize. Wild Pack of Canaries scored a vinyl pressing of one of their albums. Bearcoon used their cash prize to complete their studio work on their debut album. This juxtaposition—established names in the industry sharing a space with musicians vying to reach a larger audience—provides one of the most distinctly Long Beach events while showcasing the power of one really simple thing: live music from talented humans. 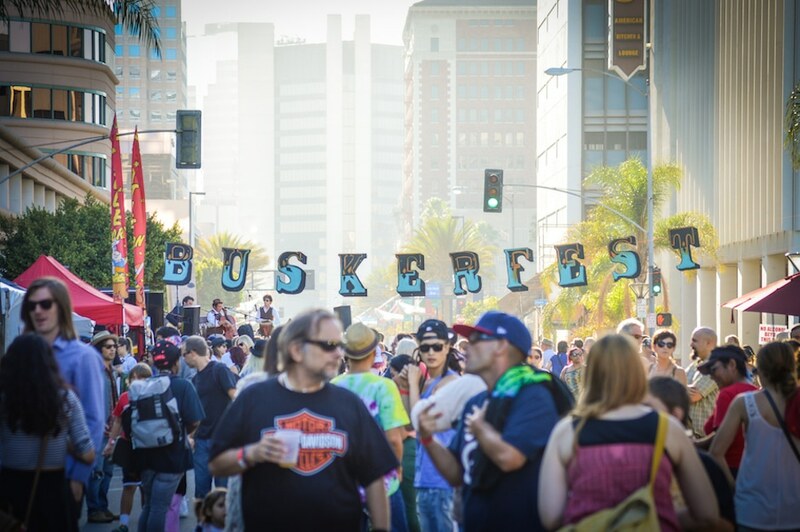 For the ninth year in a row, SAM will come to a close—and once again, it will close with Buskerfest on August 19 from 5PM to 11PM in DTLB’s East Village at 1st and Linden. Expanding its footprint to better accommodate bands, four stages will be taken over with some of the best local and regional musicians, each performing low-tech, stripped-down sets while vying for wooden nickels from audience members. Attendees vote for their favorite bands with wood nickels and the act that collects the most nickels will be awarded a package designed to help them further their career. Pair this with Buskerfest’s rich musical history—past performers include Rival Sons, Cold War Kids, Delta Spirit, Everest, Beachwood Sparks, Avi Buffalo, Tijuana Panthers, Chicano Batman, Sam Outlaw, and others—and you have an incredibly distinct night of free live music. Headlining (and not competing for wooden nickels in the competition) will be none other than indie pop masters Milo Greene, afrobeat’n’funk collective War Girl, Joachim Cooder, and Bob Forrest & Mike Martt (of 80s LA punk masters Thelonious Monster).